Classic design can inspire contemporary living. Available in four sizes, Verona features the traditional panelled construction and sweeping lines but introduces a new carved ribbing detail, giving extra definition to the generous curves of the headboard and footboard. Handmade in mahogany, it also features beautiful feather mahogany panels. The perfect blend of classic and contemporary, it makes an impressive statement in any bedroom. With colour and decorative detail back in fashion, minimalism is out – and bedrooms are returning to being romantic and cocooning. A classic upholstered French bed from Simon Horn makes the perfect centrepiece for a grown-up feminine bedroom. Pretty curves and hand carved detailing put luxurious statement beds right on trend. Available in six sizes, from Double to Emperor, our beds are handmade and custom finished to order. The wood can be polished or hand painted and the head/footboards can be caned or upholstered in the customer’s choice of fabric. Shown here is our Reine de France upholstered with a natural wood finish. In France, which inspires so many of Simon Horn’s beds, many people still maintain the tradition of changing all their soft furnishings from season to season; not just bedcovers, but also bedlinens, curtains and even rugs, swapping warm tones and textures for light summery colours and fabrics. You can make a big difference to the look of your bedroom just by changing your bedspread – bright white is always a good start – and adding a simple throw – choose one of this season’s trending colours; rose quartz pink or serenity blue. Seen here, our Mirrored Obelisk bed is perfectly dressed for the season, with white linens and a shell pink throw bringing a fresh new look to this glamorous Art Deco-inspired four poster. The Assembly House is a Grade I listed building and every room has its own distinctive character. 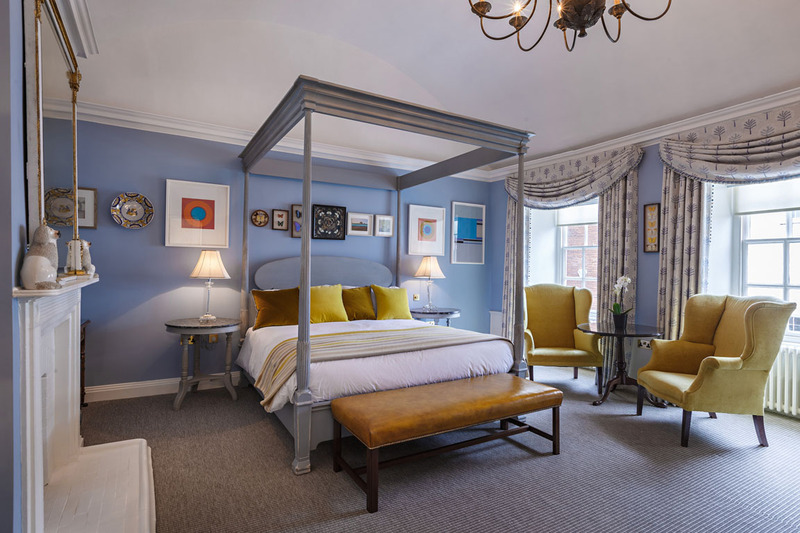 Interior designer Annabel Grey has enhanced this with her highly individual schemes featuring four very different, yet equally splendid Simon Horn beds ranging from the hand-painted ‘Reeded’ and the barley-twist ‘Mayfair’ beds to the neo-classical ‘Colonial’ and more contemporary ‘Lucca’. 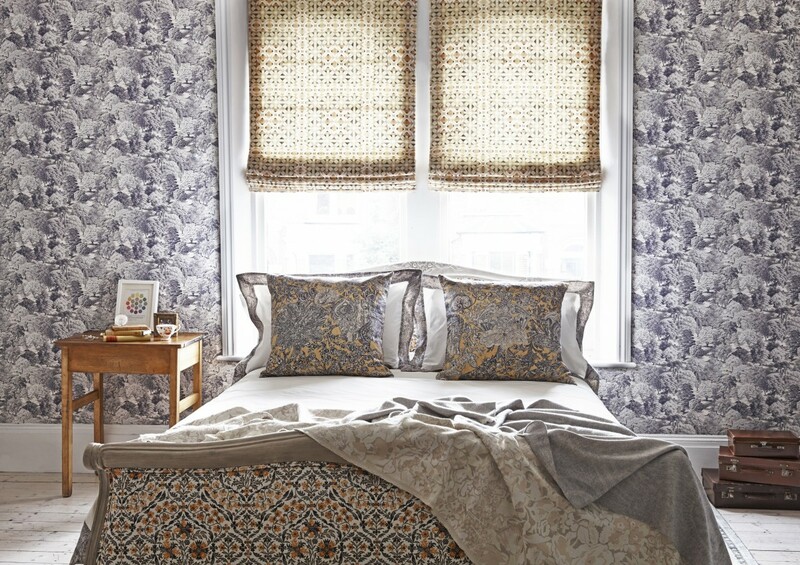 Our beds are the perfect match to a relaxed and comfortable look which Annabel Grey describes as “A grown up, eclectic combination of Georgian furniture and grand fabrics with old and new decorative elements”. Our very first beds were shown in 1982 in Liberty, always a leader in British style. 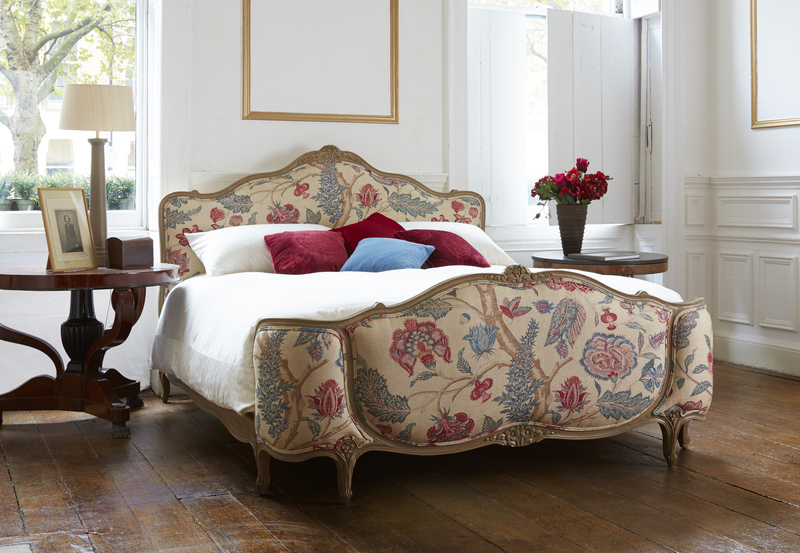 Now in 2016, Simon Horn and Liberty come together again, in a collaboration uniting two design classics; the rococo Louis XV bed and a vintage Liberty print. Our curvaceous Louis XV bed has been hand painted in ‘Pumice’, a soft creamy-grey, and upholstered in Liberty’s new ‘Petronella Chintz’ linen union, inspired by Oriental floral drawing from an 1820’s Liberty archive design. 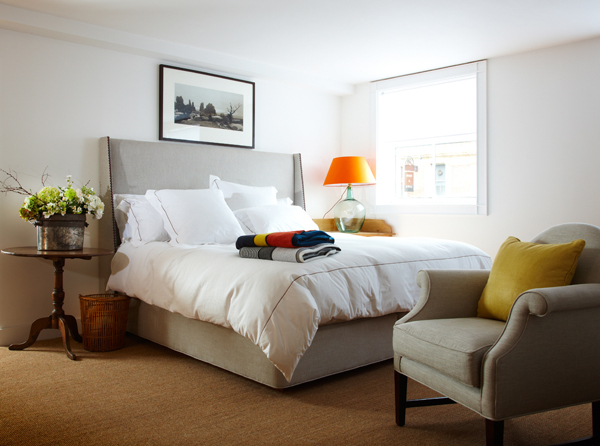 There is nothing more welcoming than a comfortable bed with a luxurious mattress and crisp white linen. The bed should take centre stage, and look sumptuous and inviting, piled high with lots of feather or goose down pillows, and a deep filled feather duvet. Layers of finishing touches could include silk bedcovers and divine throws in cashmere. If you have limited room, Simon horn’s collection of sofa beds are the perfect space saving solution, including a range of styles with sofa beds that convert into double beds or two singles for truly flexible sleeping arrangements. Lighting in the bedroom is really important, as it helps create the right mood of comfort and warmth – opt for beautiful bedside lamps and a dimmer switch. Keep decoration minimal and not too fussy, but make it feel comfortable. Fresh flowers, scented candles and a stylish clock make good bedside table accessories. Storage considerations are another factor. A guest bedroom should be free of your clutter so lots of storage space should be provided but remember to leave some space for your guests to put away their belongings so they don’t feel that they are living out of a suitcase. There is a definite trend back to ‘dedicated storage’ and freestanding pieces of furniture such as dressing tables are back in fashion. Also, many divans offer fantastic space-saving options of built in storage. Extra seating, such as a comfy armchair, is a lovely added touch. Global style really suits British homes. We’ve always been cultural magpies, decorating our homes with elements from many different countries. Done well, the Global look provides a visual feast. Done less well, the look can tip over the edge from a stylish assembly into clutter. A good tip for getting the look right is to begin at a fairly low level – with a few ‘hero’ pieces and a strong colour theme. From that point, you can start to experiment with layering in other decorative elements, from rugs and pictures to smaller artefacts, until you reach a perfect pitch. 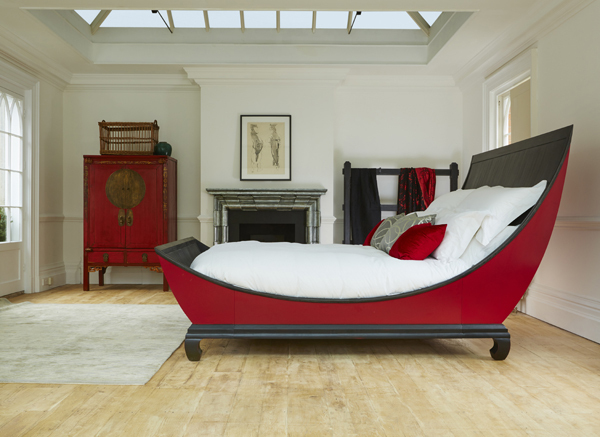 Finished in vibrant red and black lacquer, our Taipei Bed is the perfect cross-cultural hero piece for a global bedroom. Inspired by the colours and shapes of antique Chinese furniture, it’s an Oriental take on the traditional French boat bed. Creating an imposing centrepiece, it begs to be surrounded with carefully curated modern and vintage pieces to build up a room which speaks of a life well-travelled. Hand made from sustainable mahogany, the Taipei can also be custom-finished in any colour and is available in a range of sizes. New bed dressings are a great way to update your bedroom and reflect the change in season. Dressing your bed for winter is always a pleasure because you can cosset yourself using different fabrics, textures and colours to create a warm and welcoming environment. 1. For real designer style, always start with crisp, classic white bedlinens and plump pillows. 2. 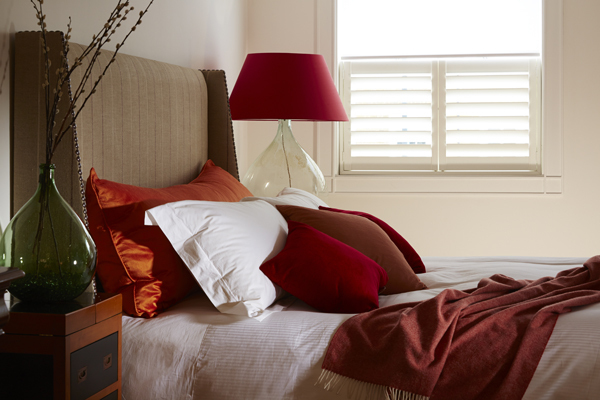 Embrace a warm palette – brighten up your classic white bedlinen with cushions or throws in an accent colour. Rich orange and deep red are perfect wintery hues. 3. Make your bed as cosy and inviting as possible by adding a soft faux fur, alpaca or cashmere throw. 4. Layer coordinating decorative cushions in different shapes, sizes, shades and materials, including luxurious silk or velvet. 5. Spoil yourself with a pure, ethically sourced goosedown duvet to keep you warm during the chilly months ahead. To respond to temperature changes throughout the winter, we recommend choosing a light 4.5 tog warmth rating. Perfect on its own for warmer nights, you can then cosy it up with throws during cold spells. All that’s left is to curl up and enjoy! Simon Horn beds and accessories are regularly specified by interior designers and boutique hotels. Triple Michelin star winning chef Marco Pierre White’s recent project, the Rudloe Arms in the Cotswolds, features 15 Louis XV beds. The celebrity chef was involved at every stage of the hotel’s design, creating an eclectic décor that features suspended giant model aeroplanes, vintage pool tables and neon signs alongside classic antique designs. The Rudloe Arms is the ninth venture in Marco’s Wheeler’s of St James branded family of country inns and pubs and is set in 14 acres of rolling Wiltshire countryside. 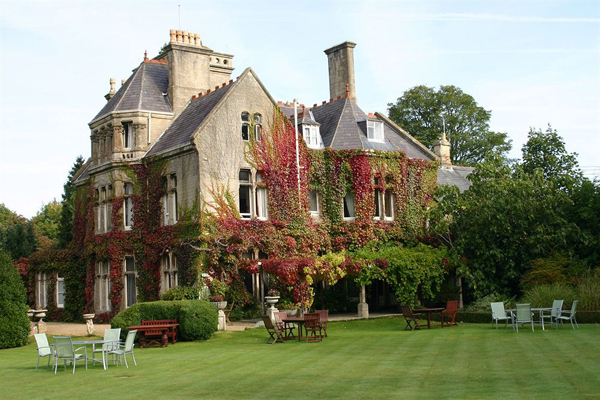 The main building is an 18th century country house with views across the Box Valley towards Bath, with a restaurant serving country pub classics. 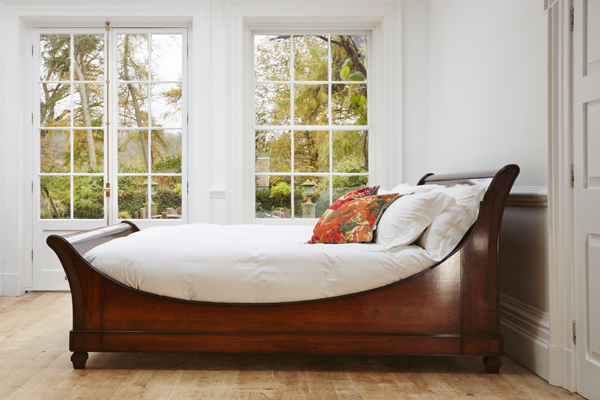 Based on antique originals, our classic French bed designs have been skilfully updated for modern living and add character and romance to both classic and contemporary interiors. The Louis XV is our bestselling bed and is available caned or upholstered in a choice of finishes.